The beautiful romantic area between Florence and Siena – known as the Chianti region – is characterized by gentle hills, romantic wine estates, ancient castles and medieval towns. 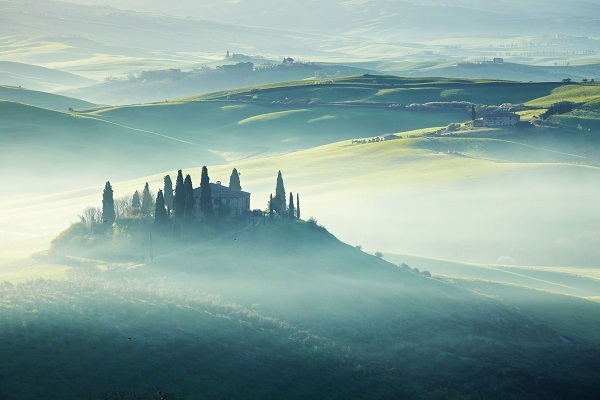 The Chianti region is Italy’s most beautiful wine countryside. Some of the most beautiful Tuscan villages are situated in the Chianti region such as Greve in Chianti or Radda in Chianti. The Chianti region offers some of the most charming wedding locations in Italy: Medieval walled towns and romantic hilltop towns are surrounded by olive groves, vineyards and tall cypress trees. In the famous Chianti region are not only produced some of the finest Italian wines – in the Chianti region you can find the most charming wedding venues for civil, catholic, symbolic and protestant marriages in Tuscany. You can celebrate your catholic, civil, protestant and symbolic wedding in Chianti in charming small towns such as Castellina in Chianti, Gaiole in Chianti or Radda in Chianti. Radda in Chianti, Gaiole or Castellina are the perfect Tuscan wedding locations for couples that love antique culture and a healthy and serene Italian pace of life. You will find just the ideal settings for a typical Chianti village wedding. The Chianti region boasts enchanting medieval villages surrounded by vineyards, olive groves and the green hills of the Chianti region about. Civil weddings in Radda in Chianti are performed in the town hall “Palazzo del Podestà”, an ancient building in the town center. In Castellina in Chianti civil weddings will be celebrated in an antique fortress in the city centre. A wedding in Chianti can be personalized by classical live music with a violinist or a singer. We can provide you with highly professional musicians for your symbolic, catholic, protestant or catholic wedding ceremonies throughout in the Chianti region and in Tuscany. Want to get married in Chianti? We plan and organize destination weddings in the Italian Chianti region!